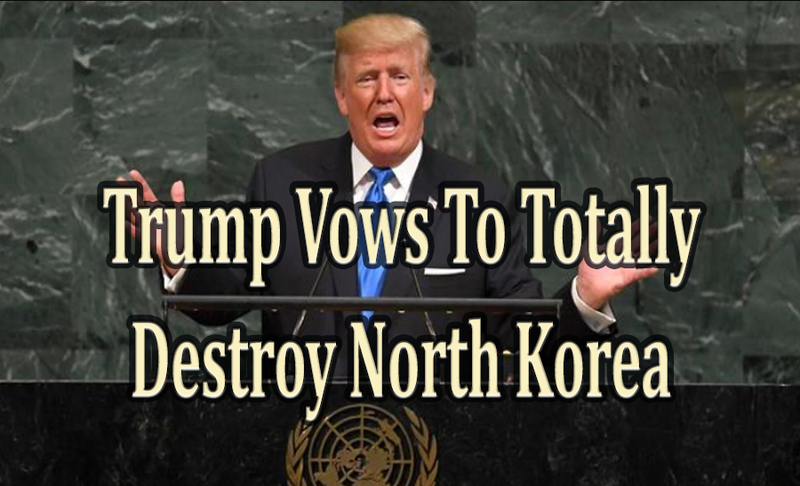 President Donald Trump on Tuesday in his address to the UN General Assembly, said if the United States is forced to defend itself, “we will have no choice but to totally destroy North Korea”. He took a swipe at North Korea and its leader, Kim Jong-un, saying the nation “threatens the entire world with unthinkable loss of life” as a result of its nuclear weapons program. “If the righteous many don’t confront the wicked few, then evil will triumph,” Trump said. Trump stressed that it was against the interest of the entire world for North Korea to obtain missiles and nuclear weapons. “Rocket man is on a suicide mission for himself,” he said of Kim. “If this is not twisted enough, now North Korea’s reckless pursuit of missiles and nuclear weapons threatens the entire world,” Trump added. While he thanked Russia and China for supporting recent United Nations sanctions on North Korea, Trump criticized them for for continuing to do business with Kim.